Back in 2004 I met a group of people in London, Serbian activists who were planning to host the next Peoples Global Action gathering in Beograd. I went to Beograd with them and spent the next six weeks of madness helping to organise that event. I formed deep friendships and my life changed forever. We went on the form Queer Beograd Collective together. 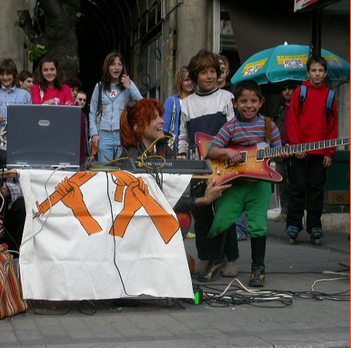 Queer Beograd is a queer antifascist collective working in Serbia organising radical cultural festivals (among other activities) since 2005. As a collective our work has always been to make connections between all the aspects of society, to understand how these factors impact on us and perpetuate a system of oppression, for us there is no ‘single issue’. Ours is a politics of the interconnected. We began at a time when it was impossible to hold a ‘pride march’ in Serbia. We formed the collective with the intention of building a radical queer scene and politics from the ground up. We needed a place to be able to meet and express ourselves without the fear of day-to-day violence on the streets. And we wanted to do something to strengthen our own communities and politics first, to form the groundwork for an integrated queer politics that made totally clear how a militaristic nationalistic state, the power of an orthodox church and capitalism propagates a sexist, racist, homophobic society. But first and foremost of we wanted build a free cultural space as a microcosm before worrying again about how to present a public face of that to a very homophobic society. Queer people were so exhausted after the violence of pride in 2001 and the impossibility of pride in 2004, we had to make another strategy that allowed us a place for ourselves. Our festivals were designed to be both a gathering place where people could meet and share time with each other and also a place of political education, action and allowing otherwise hidden voices in Serbian society to be heard. It was first and foremost about making a space where we hoped in our collective solidarity to find individual empowerment and potential for the future. Several years and 5 festivals later, we continue to work together and separately in a broad network of organisations and activities. In women’s organisations, in lesbian organisations, in anti-fascist organisations, in anarchist groups, as writers, artists, performers, in every way that is a part of our daily lives. The biggest problems of our lives continue to be the day to day ones: earning enough money to live, being able to pay rent and bills, dealing with issues of our own freedom of movement, having the physical and emotional energy after many years of working for very little to maintain a political and cultural practice which challenges and nourishes not only ourselves but our society. Currently we want to leave another legacy in Beograd, that of access to information and ideas, in the form of books. Access to information that it is hard to get in Serbian society; and to continue to generate as part of our projects and document those voices that are so important and yet so little heard. Always, as ever we refuse the single issue, for us radical queer politics will always be a politics of action, on as many different levels and whatever means are possible. From whatever ground we find ourselves standing on and with who ever we find ourselves standing next to.